It has been said before, but it bears repeating: 2016 has been a rough year for television shows with a musical component. HBO's shimmering Vinyl collapsed under the weight of its monolithic, Scorsese-directed premiere, while Showtime's Roadies went for a slightly softer touch that few noticed throughout its 10-week run. Elsewhere, Netflix sought an alternative route with The Get Down, offering a decidedly big, boisterous, but often chaotically arranged – i.e., a true Baz Luhrmann experience – 90-minute pilot that opened the door for another five installments that were served well by their shared ambition, if not the clarity of their composition. That brings audiences to Donald Glover's new series Atlanta, which debuts on FX with such a strong, surefooted premiere (that's actually the first two episodes, 'The Big Bang' and 'Streets on Lock') it quickly jumps to the head of this year's Best Of list. Even if the bar hadn't been set low, Atlanta would still be head and shoulders above the rest. Although the comedic drama orbits the world of hip-hop, especially that born from the series' titular locale, it is more focused on and fascinated with the interpersonal endeavors of a small group of incredibly well-drawn characters who are, almost immediately after meeting them, worth caring about and becoming invested in. In addition to writing and executive producing, Glover stars as Earnest Marks, a young, underemployed man looking to break free from the rut he's in and to accomplish something he's passionate about. When the pilot begins, Earn (as he's called) is ostensibly homeless, spending most of his nights with his semi-estranged girlfriend and mother of his child Vanessa (Zazie Beetz) or Van. Like most relationships in the series, Earn and Van's is complicated; there's history there, a great big canvas that, in the premiere, Glover paints by leaving a few strategic strokes out. The early morning exchange between the two is an example of how the series works by crafting scenes that conceal exposition and underline character desire with basic interplay and well-written dialogue. Scenes like the one illustrating Earn's romantic/parental predicament is evidence that Atlanta does a great many things well, but that it all starts with the strength of its perspective. Earn's temporary transience is pivotal in understanding where he is in his life. He lives in the liminal space between ambition and success, but the same is true for almost all of the other characters as well. While the story is told primarily from Earn's point of view, his cousin, rapper Alfred Miles (Bryan Tyree Henry, Vice Principals), aka Paper Boi, is a central figure in the narrative, as his underground music career is in a similar liminal space between becoming a footnote and breaking out into the mainstream. Alfred has had some limited success, but in order for him to transition into the rap game full time, he needs someone there guiding his career – that's where Earn comes in, offering to be his cousin's manager. "Rappers need managers? I'm just trying to get paid real quick," Alfred tells Earn. But it's a mutually beneficial offer that would improve both their lives – giving Earn the kind of opportunity and challenge he's clearly looking for, while also setting Alfred up to move away from being a low-level drug dealer with his good-natured friend Darius, played with charming ease by Keith Stanfield (Selma, Straight Outta Compton). The show's explorations of Earn's personal struggles, and the way events in his past have shaped his current situation (the details of which remain undisclosed throughout the first few episodes), help serve the way in which Atlanta can be viewed a story about ambition. The issues of the series' protagonist underline how circumstances of race, geography, emotion, familial obligation, and so on don't preclude a person from wanting to see those ambitions come to fruition. This focus on aspiration – maybe even desperate aspiration – allows the show to do what so many half-hour series have excelled at recently. Like its sibling shows on FX and FXX, Atlanta is a great many things at once. It's a comedy with dramatic elements – or is that a drama that excels at comedy? That's undecided, but like Louie, Baskets, Man Seeking Woman, and You're the Worst, Glover's series isn't necessarily confined to the usual parameters of a half-hour show – comedy or otherwise. Instead, it aims to define what the parameters of this particular series is one episode at a time. Moving between moments of raw humor, dark violence, and existential anxiety, Atlanta occasionally comes off as abstract and its tone unpredictable. The premiere is directed by Hiro Murai, who leans into these notions with aplomb, weaving in and out of scenes, making terrific use of an early nonlinear structure to lend the show a dreamlike quality that takes Earn, his desires and foibles, and suspends them in a medium of uncertainty. Murai's visuals elevate the already strong sense of character and place that give Atlanta a very welcome, lived-in feel, making it a satisfying watch from its premiere on. There are plenty of shows about the uncertainty that comes with growing up and the fears of never making your way in the world, especially when that world seems engineered to work against you because of things you cannot change. That helps ground the series in a distinctive and important point of view. And that sense of being grounded also allows Glover and Murai room to move around when it comes to matters of tone and the sometimes-startling difference between comedy and drama. Atlanta is often very funny but in a way that rarely relies on jokes. At the same time, the series opens up with a possible homicide, creating what seems to be an immediate tonal contradiction until you realize just how deliberate the shift in tone is. In the end, that's just one of the ways that Atlanta makes its mark. It's an incredibly well written series filled with great characters who help fill the gaps throughout the first episodes as the series finds its footing. It is the kind of show that starts strong and only gets stronger. 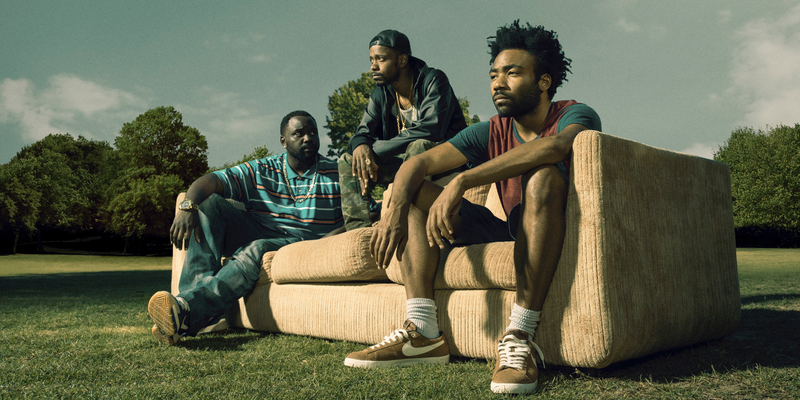 Atlanta sets the standard for the rest of 2016's television premieres. Atlanta continues next Tuesday with 'Go For Broke' @10pm on FX.